The pre-match talk, about a tight game against the league leaders where one goal would settle matters, was discarded within a jaw dropping opening three minutes. Aquinas were one up within a minute after a charge from goal machine Maguire, and were promptly one down on three minutes as Ards produced two quick fire responses. This scintillating game saw both teams alternating in attack. During a period of Aquinas pressure O’Boyle produced a long distance wonder goal which curled into the top corner to level on thirteen minutes. Aquinas showed tremendous courage throughout with Flynn and O’Hanlon battling for midfield possession with tenacious Toner getting in on the action. A rare lapse on twenty minutes allowed a nippy Ards striker to zip through an otherwise solid Aquinas formation and restore the Ards lead. O’Boyle was having none of it though and rocketed level almost immediately after the restart following great work from Rainey and Toner. 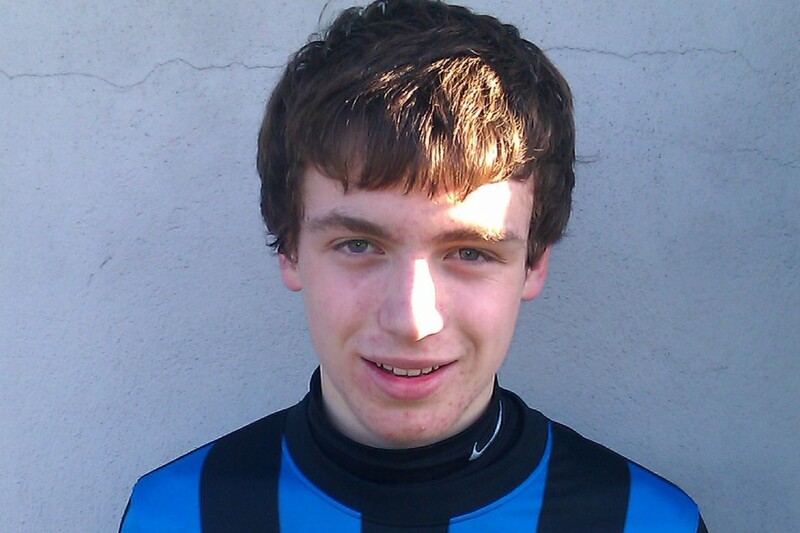 A superb point blank save from McGovern, following an Ards corner, kept the Blue ’n’ Blacks on terms at the interval. Four minutes into the second half O’Connor, who had a tremendous game in defence with Lynch and McCourt, lashed in a shot from the bye line and Carson gleefully stabbed in the parried save to give Aquinas the lead. Ards pressed forward in response and the intervention of McGovern, the crossbar and a goal line clearance kept Aquinas out of jail for a nervy period in the last quarter. As Ards pressed for an equaliser Mohan converted up field, leading to a Rainey pinpoint corner. Flynn met with a net bulging header giving Aquinas some breathing space at last. As Ards threw everything forward Hughes and O’Sullivan held possession, frustrating their attempts. After a super exchange between Cunnane and Morgan, Maguire added some pollish to the score line with a fine solo run and finish in the dying minutes. This was an exhilarating game of football between two fine teams who first played each other on exactly the same date in 2005. The score that day? 6-3 to Aquinas.